This is a great opportunity to buy a matching set a very a low price. 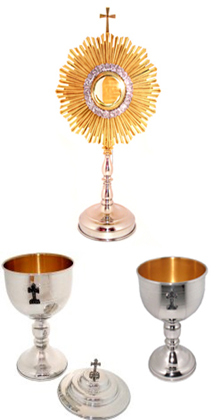 The set includes: Monstrance, Chalice and Ciborium. All these items are forged in Pewter by skilful artisans. Both chalice and ciborium present inner gold plated 24 kt cups. The monstrance displays a gold plated 24 kt crown and beautiful angel motifs.